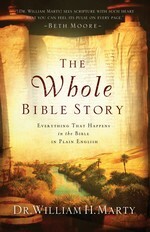 When I first saw “The Whole Bible Story,” by Dr. William H. Marty, listed as one of my review choices from Bethany House, I was really excited about reading it. For one, the author was one of my professors while I attended Moody Bible Institute in Chicago. I enjoyed the class he taught: Survey of the New Testament. Dr. Marty always had a way about him that made learning the facts of the Newt Testament interesting. So, I was really curious to see what this book was like. The other reason I wanted to read the book was because it sounded like something I would enjoy reading... and, I was right! This book is considered to be “a Bible story for grown-ups.” It is not a translation of the Bible, and it is not a paraphrase of the Bible’s 66 books. It simply tells the story of the Bible, as if someone was just talking to you and giving a narration. It is meant to be used as a tool alongside the Bible, to help readers better understand what they are reading. It would be great to give to a new Christian who doesn’t really know anything about the Bible, or to someone who is curious. But, it is also good for anyone to read who desires a better understanding of the stories that happen in the Bible. Sounds like a good read. Thanks for letting us know about it.